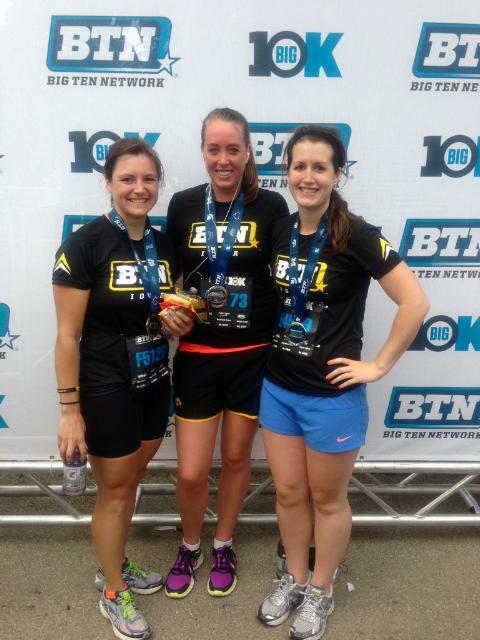 I have a bunch of race recaps are training recaps to write and I am miserably behind. But good news, I am in the taper period now so I should have a little extra time to write. I should also be using this time to clean my apartment because I am sure things are going to start growing on my floor soon if they haven't already. And yes, it's that bad. I realize you may no longer give a rat's arse about this race, but I like being able to go back and read these so I'm writing this anyways. Last year, I heard such great things about this race and I was thrilled this year that I was free the day of the race. 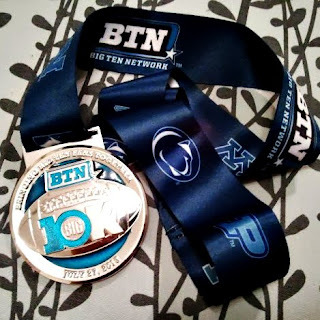 Big Ten schools, football, tailgate, food and beer? Sounds good to me! Since this race started at 7 am and I also needed to go into the city to pick up my packet, Erin so graciously offered to let me stay at her place on Friday night. I had originally planned to ride the train downtown and then bike over to Fleet Feet to pick up my packet and then over to Erin's, but about halfway on my drive to the train station, I realized I forgot to grab my bike lock. So I had to turn around and go back home to get it which caused me to miss the train. I was a little upset because I think this was the first time in my life that I left early for the train with plenty of time to park and then I missed the train anyways. Derp. So I ended up driving into the city. Thankfully parking near Erin's was no problem. Packet pickup was easy and quick and I had no problems getting my shirt. Erin made a delicious dinner of Indonesian chicken with peanut sauce and we chatted before calling it an early night. Thank you so much to Erin and her husband for letting me stay at their place! I woke up just after 5 am and got ready before biking over to Adler Planetarium. The race had set up bike racks so I was able to lock my bike to one of those and walk over to the starting area. The bagel I bought for breakfast the day before was carefully tucked away back in my car so I had to get creative. After dropping my bag off at gear check I headed to the Clif bar tent to sample some bars for breakfast. I probably needed more than a few bites for breakfast but I didn't want to seem like a greedy pig and there wasn't anything else for food options! Since I figured the 2ish mile bike ride was enough, I didn't bother with any other warm-up and lined up in corral F. Let's take a minute and talk about the corrals. When I registered I estimated my pace to be somewhere in the 8:45-9:00 min/mile pace, granted I did not end up running that pace on that day, but I am capable of that. I had 2 coworkers running this race as well both of whom put slower estimated paces than me, in corrals before mine--one in C and one in D. My coworker Sam mentioned that another girl in her corral asked her if this was the 8 min/mile corral and she was confused because she was planning more like 10 min/mile pace. Bethany mentioned she thought the corrals were organized strangely as well because she was in corral I and estimated a 10 min/mile pace. I had to pass a lot of people out on the course. I'm still not sure what happened with the corral system organization but I definitely think that needs to be fixed before next year. Surprisingly I've never run a stand alone 10k race before, but I've run at 3 at the end of Olympic distance triathlons. So I already knew I would get a PR but my legs weren't feeling super great due to a track workout on Thursday. This race was intended to be a fun* race anyways so I wasn't too worried. I waited probably 10 minutes after the race start for my corral to cross the start line and started to run a slightly above comfortable pace. I didn't even bother to wear a watch again since my handy old stop watch is now sitting at the bottom of Lake Zurich courtesy the last triathlon there, but the course had clocks at every mile so I relied on them to gauge my pace. The weather was actually fairly cool so I didn't feel like I was dying. yay! If it was hot I was fully planning on going down the slip'n'slide they had at the turn around. How fun! Actually I'm still a little disappointed I didn't do it. We did get to run on Lake Shore Drive for some of the first part of the race and turned off the drive and onto the Lakefront path to head back towards Adler. This is where the crowding really started to bother me. Course crowding at the start is a normal thing and usually it lets up after the first mile when people settle into their pace, but the second half of this race was very crowded. Like I mentioned earlier, I was passing quite a lot of people as well as getting passed by people. I ended up running a lot on the right gravel side of the path to go around people. I'm pretty convinced this had something to do with the corral system! My 5k split was 28:39 which meant I ran the 2nd half 22 seconds faster than the first half! Negative splitting! After crossing the finish line I very slowly made my way down the chute because it was packed with runners and collected a bunch of snacks, gatorade, water, and my medal. I met up with my coworker Heather and we headed over to get in line for our free beer and then in line for free sausage before the lines got too long. 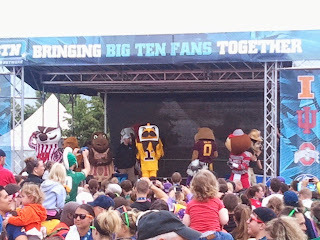 We hung around after the race to watch the action on stage including the mascots dancing and all the fan spirit awards. 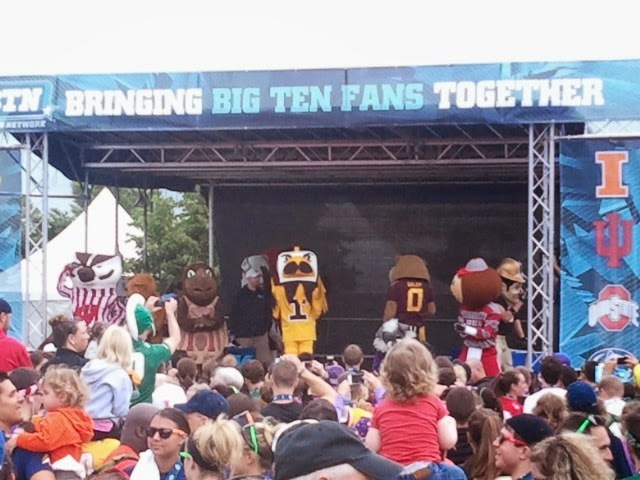 Herky was out there cutting a rug of course. The Maryland and Rutger's mascots since they are the newest two schools to the Big Ten conference. Remember when the Big Ten was just 10 schools? At the after party there were also a lot of games including bags, 40 yard dash, and field goal kicking. I didn't play but I watched the 40 yard dash for a bit and tried to guess which person of the two lined up would win each time! I started to get chilly so I didn't stick around too much longer before getting my bike and biking back to my car. Overall, I really liked the concept of this race and that you get a school-specific shirt. It was cool to see all the different fans represented out on the course. I would do this race again next year, but I hope they find a new location if they want to grow beyond the 13,000 something participants they had this year. And I hope they fix the corral system! Venus de Miles-a bike event done well!